From what I can tell, I’m not the first to do a review on this book and so many have given great reviews. I’m not exactly breaking ground here in this review, but I do talk to a lot of starting writers who need a boost forward and this book is unknown to them. I hope that those writers visit my blog, so this review is for those who need a good starting point. And this book is that starting point. I do this review for anyone who hasn’t read this book because I think it deserves all attention it can get. 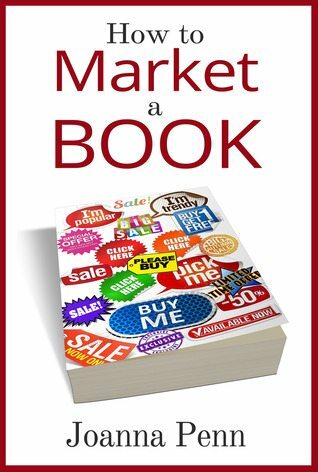 Now it might seem weird to start thinking about how to market a book before you even write the book…how can you market something that doesn’t exist yet? It’s kind of backwards thinking, but in this day and age, we don’t just sell our stories, we sell ourselves. We let people get to know who we are and what we do, which enhances our sales. No longer is it just the stories to make us who we are, but also who we are that makes our stories. It’s more than that though. How you choose to market yourself will have fundamental decisions right from the beginning. Before you buy a pad of paper or open up your word processor for the first time, how you plan to release this book will influence how you write your story. Beyond how you plan to sell your book, you need to put yourself out there as a writer and start building a fan base. Start making connections with other writers. I started reading this book at the beginning of December. I actually got this book for free for my success at NaNoWriMo 2013. Having read it, I can state that I strongly encourage others to buy this book. More than that, as I begin my writing career, I find myself once a week thumbing through it to get guidance in many decisions I make. The one thing I do like about this book, is that there is very little bias. With writers, there is a line drawn in sand of traditional publishing and self-publishing. This book gives you both as an option and tells you what you need to know to do either one or both together. I’ve met a lot of beginners who want to write books who firmly believe the first point. They want traditional publishing because the publisher will take care of everything and all they need to do is write. Nothing can be further from the truth and Joanna Penn gets it right in her explanation of marketing. In the first section, it asks a very important question. How do you define success? Ex. Being on the New York Times bestseller, top spot in amazon category for genre, seeing your book on a bookshelf in a random store? Nothing wrong with any of those, but perhaps the one most people want, to make a living. This book address all of that. The book then discusses advertisement, traditional media, your platform, your brand, blogging, and social networking. It discusses all of these in great detail and discusses a lot more. For me reading this book, most of this I already knew. But for me, I spent the last 2 years studying how to be success in this market and so many other resources. Her book confirmed a lot that I already knew. What I like about this book beyond what I already knew is that she isn’t one to just say “Do this to be successful” but she tries to address “Why this is important”. Many resources simply say do it because I said. I feel there is an element of the writer that cares what she puts out there. More than that, she tells about her own experiences to help illustrate her point. I give this book a 96%. The only aspect of this book I don’t like (which is a very small issue) is how she is with money. Not that she’s bad with it, but I feel some of this book doesn’t speak to me because I am starting out with nothing. While it is true you have to spend money to make money, she appears to have a relaxed attitude about it, and doesn’t really discuss costs of thing, often briefly going into it. I’m sure once I see success, I will get more out of the book, but a good many starting out don’t have the finances to really hit the ground running. To this event, we tend to be very conservative in our approach, taking on cheaper alternatives, or even free ones. Her book does discuss free options, don’t get me wrong. There are many fundamental things you can do to market yourself without spending a dime. She is very good on that. My complaint is how relaxed she appears on the concept of spending money. I have a lot of respect for the Author, whom I follow on Twitter, Goodreads, and other sites and she always has good advice on her blog. I like that she practices what she preaches and this is one book I list on my site as one of the most important books, even above Stephen King’s “On Writing”, and I personally feel that is the bible of writing. If you do get a chance, go to her website and sign up for the page to get a copy of Author 2.0. I haven’t read it yet, but if this book is any indication, it will be a good read. I do plan on reading this book soon enough, and will likely come back here and do another review.